The armor worn by the Emishi during this time is based on Japan's Kofun culture, and the evidence for this comes from the kofun burial sites. What makes this challenging is that for many sites in areas where they may have lived there are no actual markers to indicate whether a particular kofun site is Emishi or not aside from warabite-tou swords , however, few sites have these and armor together, and there are of course no known contemporary emaki paintings of these people during this time. The only way to try and reconstruct what they wore is by using archeological evidence from kofun burial sites in areas where they were known to have lived (according to historical sources) along with the limited literature about what they wore. Unlike the ubiquitous warabite-tou very little armor is preserved. Much of the evidence is indirect except for a few scattered remains. From what is known, the large Japanese kofun sites have abundant evidence in the form of haniwa that show fully armored warriors in very good detail. From these we can reconstruct how this armor was worn even down to the details of construction and how where they were tied together on the warrior's torso. We also know from these haniwa sculptures that the horse was very important to them judging from the numerous examples. Even horse equipment has been recovered from a number of sites from the Kanto and Tohoku. Gumma, Tochigi and Saitama prefectures have been areas where a number of haniwa warriors with full armor have been found dating from the sixth century (Kidder 1964: 192). These locations are important as northern Kanto (and Fukushima prefecture) represents the frontier at that time. All of these sites are thought to have been the work of local Japanese clans (gozoku), however, frontier clans both traded with and fought the Emishi, so the Emishi had adopted kofun armor and culture to some extent. This is known given what we know of Emishi culture, particularly their reliance on horses. Generally, tanko were used by the Japanese military up to mid-seventh century AD (c.650) (used for longer in the frontier areas). Keiko style armor became widespread in the Nara period, during the eighth century AD. My interpretation is based on the assumption of a clear lag in adoption between when the armor was produced by the Japanese and when they were adopted by the Emishi. This is based both on a technological lag between the two and when they likely reached the periphery through trade and gifts. Iron armor rusts away in the acidic soil of Japan and is not readily preserved, so the haniwa have been the best evidence for early armor. Unfortunately, haniwa abundant in large Japanese keyhole burial mounds (zenpo-koen-fun) are not found in smaller local tombs such as yoko-ana bogun. Recent finds from smaller kofun indicate that keiko was more widely used as these have been found in tombs from what is thought to be Emishi held areas. In reality there were many Emishi who did not wear body armor at all, and appeared wearing either deer hides in the mountainous areas or imported cloth from the Japanese. I assume that in Emishi held areas both tanko and keiko were in use as this transition in armor for the Emishi came during the seventh through the eighth centuries AD (650-800). Helmet from the ueta ezo mori kofun 上田蝦夷森古墳 site. 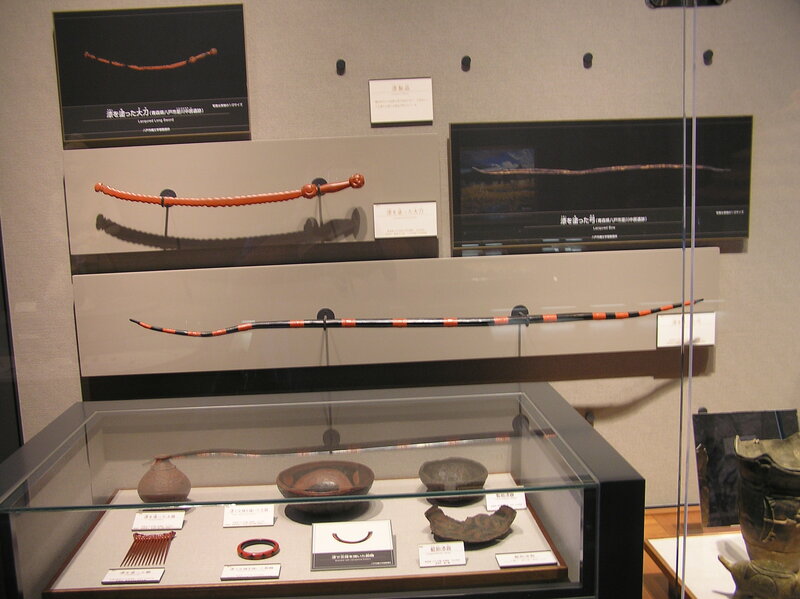 Warabite-tou sword from Iwate prefecture hori-no i-seki 堀野遺跡. 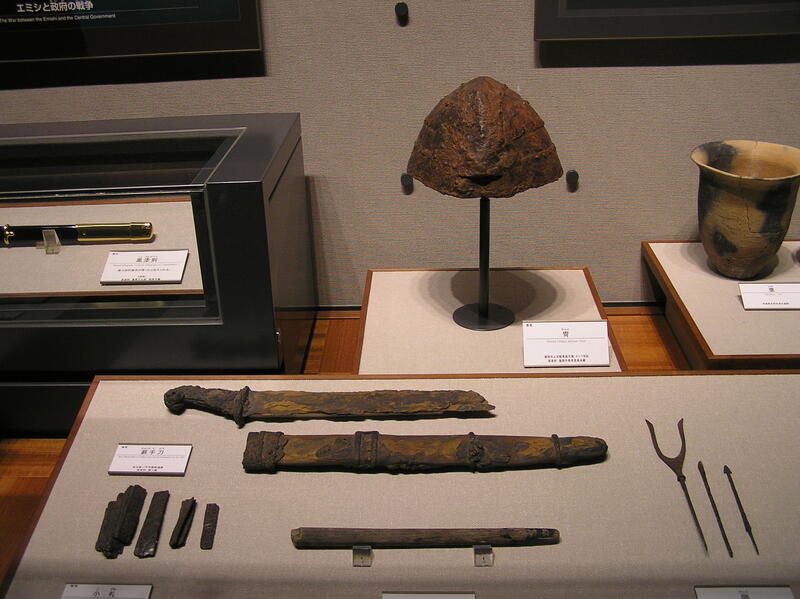 Bottom left: armor slats that were stringed together with leather or silk cords for helmets and body armor from Iwate prefecture go-sho no i-seki 御所野遺跡. All photos by the author. All objects displayed in Tohoku rekishi hakubutsu-kan 東北歴史博物館in Taga-jou City. 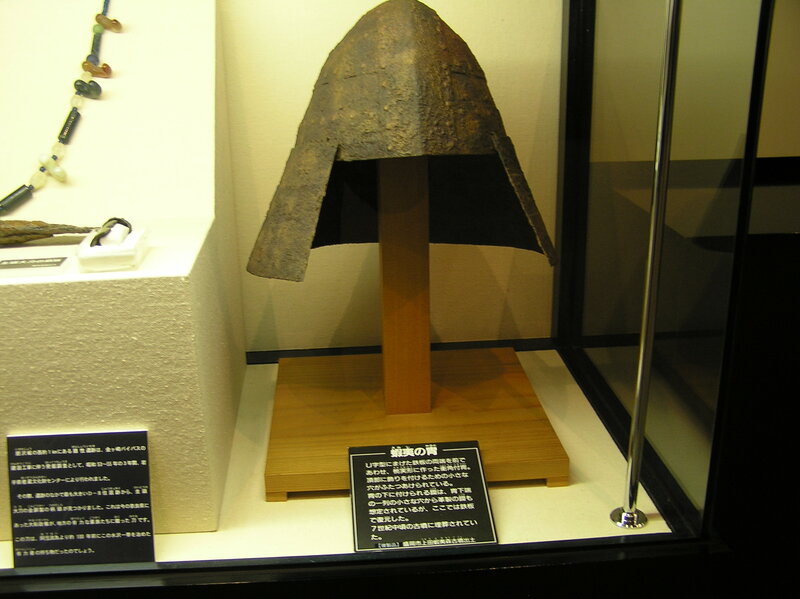 For example, one particular ezo-ana kofun site in the Kitakami area that was central to the Emishi territory produced a tanko style helmet. This is direct evidence of tanko usage, but this is a rare instance of preservation. There is little doubt that this site, the 盛岡市上田蝦夷森古墳 Morioka-shi ueta ezo mori kofun in present day Morioka in Iwate prefecture was an Emishi burial (1991:190) (above photo). It becomes much more clear in the latter half of the eighth century after the beginning of the so-called Thirty-Eight Year conflict between Japan and the Emishi. Early on in that conflict, the Emishi Korehari no kimi Azamaro plundered the storehouse of Taga Castle during his attack there and took the armor (2005:160). This was most likely the latest keiko armor that had been distributed there by the Japanese state for the purpose of fighting the Emishi. There is little doubt that this was then re-distributed among the Emishi forces in the north Miyagi area (central Tohoku) for their own use. The Shoku Nihon-gi has perhaps the only real description of Emishi clothing as consisting of deerskin hides when two Emishi were brought to the T'ang court by the Japanese envoy in 659 as seen on the Conquest page. Aside from this, Ainu clothing centuries later showed the bold geometric patterns that are directly inspired by the designs on ancient Jomon pots, and thus perhaps were used by their ancestors the epi-Jomon and Emishi. Probably the use of smaller border patterns during the Emishi age preceeded the emergence of the bolder patterns seen in the Satsumon and later Ainu culture. This is a sound premise but direct evidence is lacking. The illustrations throughout this website1 is an indication of the continued evolving picture of Emishi armor, a picture that changes as new material is discovered from kofun sites, and as new scholarship is incorporated. For example, on the Conquest site a few revisions back, I illustrated the general Aterui in full tanko armor, however, after further study there is no doubt that the Emishi chiefs had access to keiko armor by the late eighth century. Lower ranking Emishi who did not have a fushu relationship with the Japanese probably wore whatever armor was available to them. They most likely wore handed down tanko or keiko armor or traded from other Japanese frontier kofun chiefs on the secondary market on the periphery of the empire and even scavenged from fallen Japanese soldiers they fought. They most likely began to produce their own armor in imitation of Japanese models, however, this is not verified. Another helmet from ueta ezo mori kofun 上田蝦夷森古墳 (circa mid-7th c.). All photos by the author. From Oshu City Cultural Studies Center 奥州市文化財調査センターin Mizusawa City. The bow of the Emishi was made most likely of laquered maruki wood. There were also maruki wood bows that were not laquered. These bows were in use during the Jomon period before the Emishi. However, the bows used by the Ainu were the same or similar (see ilustration in Origins of the Jomon). This means this type of bow was used from the Jomon time period through the Ainu, and thus most likely were used by the Emishi who were between the two chronologically. From Aomori prefecture korekawa chu-kyoko i-seki 是川中居遺跡. All photos by the author. All objects displayed in Tohoku rekishi hakubutsu-kan 東北歴史博物館in Taga-jou City. 1. Sasama, Yoshihiko. Nippon no katchiu bugu jiten (Dictionary of Japanese Armor). Tokyo: Tsukasa sei-han publishing, 1981. Throughout this site I have used this excellent work as the main reference for the appearance of all armor illustrated. The work does not address Emishi armor specifically, but has information on various tanko and keiko used during the kofun and Nara periods. Kidder, J. Edward. Early Japanese Art: The Great Tombs and Treasures. Princeton: Van Nostrand Co.,1964. Kudo, Masaaki. Michinoku kodai Emishi no sekai. Tokyo: Yamakawa, 1991. Kudo, Masaaki. Kodai Emishi no Eiyu jidai. Tokyo: Heibonsha, 2005.